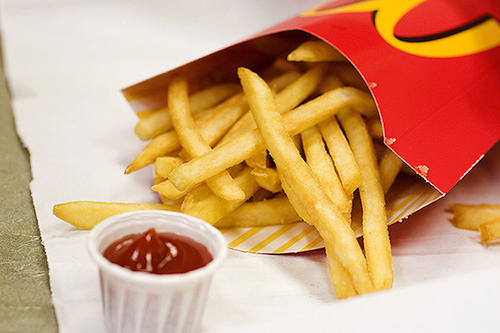 When I was growing up, the McDonald’s french fry was the holy grail of fast food items. I remember a specific day when I was a preteen that my body could no longer tolerate eating them. And that’s no wonder! It turns out their french fries or junk! French fries use Russet Burbank Potatoes, a potato that’s cheap to grow, but blemishes easily and gets Net Necrosis, a potato disease, relatively easily. So McDonald’s needs to spray it with a pesticide called methamidophos. After harvesting, the potatoes aren’t even edible. They have to sit inside of a football stadium sized “atmospheric shed” for six weeks before they can be eaten. Watch the video below for the full, disgusting story.